We’re all holding on to something, whether we’re conscious of it or not. In this post, I’m focussing on our tendency to cling on to Pain from the Past, verses Grace in the Present moment. with you (anyone who’s a part of my day and life). heartfelt talk) will never happen again. do I want to leave you in Pain or in Love? “It’s true… but it’s not easy,” A says. It’s not easy, it’s true. Especially when you’ve been hurt. 10 times more! An eye for an eye! and if possible, cut them off from your future. them in Love… not Pain. to put this lesson into practice. between the Past and the Present. “Another way in which we can transform our darkness and “easter” the new life of the new self is by holding the painful tensions within us – the tugs between what the ego wants and that to which the True Self calls us. …The first step toward growth is to enter these tensions, embracing and exploring the pain and ambiguity within rather than running from them, concealing them, or anesthetizing them. …This interior integration and healing of the soul is our aim. But it can’t happen if we avoid the pain and tensions within us. Once, when my counselor and I were discussing Joseph Campbell’s captivating dictum ‘Follow your bliss,” he commented, “It may be just as important to follow your agony.” Perhaps we can’t find our real bliss until we begin to contront our agony. The poet Gibran wrote something similar: “Your joy is your sorrow unmasked. The self-same well from which your laughter rises was oftentimes filled with your tears… The deeper that sorrow carves into your being, the more joy you can contain. When we enter the darkness, we accept that there will be trials. In the clash of opposites, the pain and conflict pull the strands of our lives back and forth in a miserable tug of war. Fear gave me all the reasons to withhold Love. Love embraced all of my heart, releasing Love. I listened to both, and noticed how both felt like. If I put Fear aside, I knew my heart had forgiven. 14.01.15 will never happen again. to wish a loved one Happiness in life. And it left us both in Smiles. There’s Grace in each Present moment. Be present in the Present. Be here, Now. It’s not easy. But the hope is in the trying. 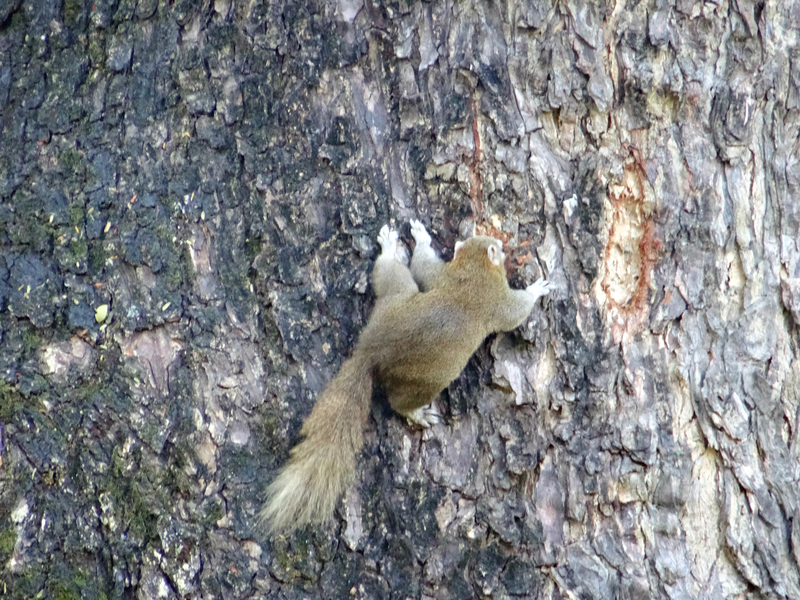 Spotted this squirrel in Chiangmai, all stretched out, “holding on.” 28.12.14.